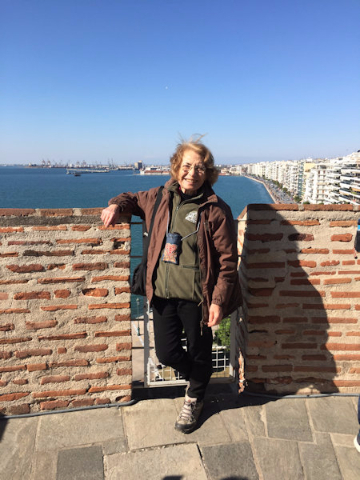 Having partially covered our Northern Greece itinerary from Thessaloniki to Ioannina, we returned to the east coast following a different path, through central Greece. 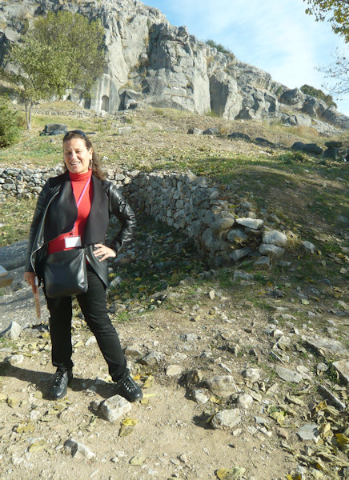 Traveling toward the Pindus mountains, we arrived at the Plain of Thessaly to view the legendary monasteries at Meteora. Thessaly is a plateau where a series of earth movements pushed the seabed upwards 60 million years ago, opening up vertical fault lines in the thick layers of earth and resulting in the formation of deep canyons amidst monolithic pillars, the highest 600 meters above sea level. Due to erosion by the elements over time, these sandstone pillars have given way to a landscape of huge rounded boulders and cliffs. Monks fleeing persecution in the 11th century hid in the caves of these rocks and in the 14th century started building monasteries in harmony with the natural contours of the monoliths. 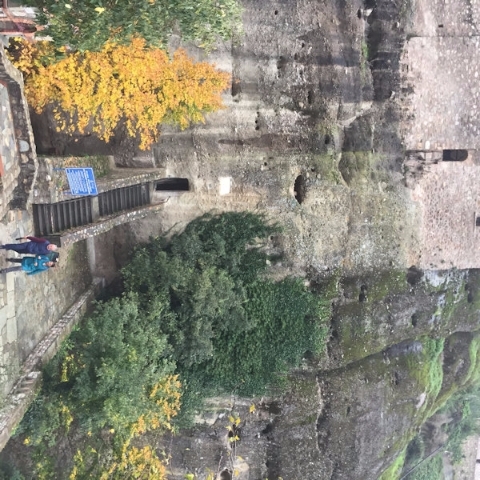 Initially access was by removable ladders to hide from attackers; stairs were carved into the rock in the 1920s. 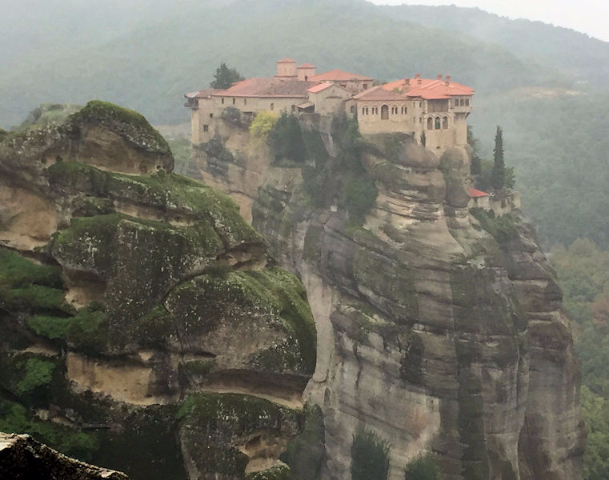 There is a total of 24 monasteries in Meteora – one of the largest complexes of Eastern Orthodox monasteries anywhere – seven of which are functioning, with two inhabited by nuns. All of Meteora is a UNESCO Cultural Heritage Site. It began raining as we drove uphill, covering the plateau under a shroud of fog by the time we reached the top. 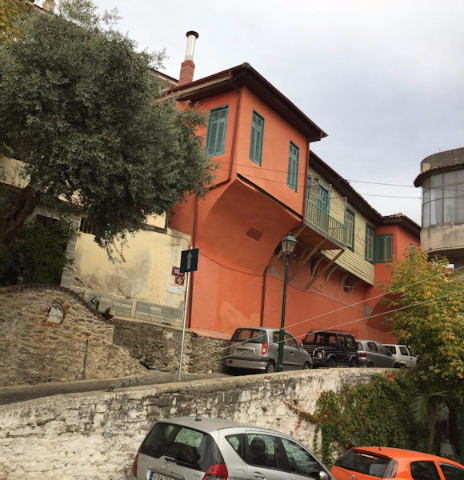 Regardless, we tried to photograph the natural and man-made phenomena, guided by the discernable red brick rooftops of the buildings atop the cliffs. We visited two of the monasteries – St. Stephen’s and Grand Meteoron, the latter the biggest and oldest one of all. It was called the “Suspended” monastery (Meteora) because of the formation of the gigantic rock it was built on. The building complex includes the main cathedral with 16th century frescoes, a museum of icons, a library, a kitchen with period utensils, and a wine cellar. Men had to take caps off and women had to wrap a skirt over their pants entering St. Stephen’s Church, embellished with ceiling and wall paintings. 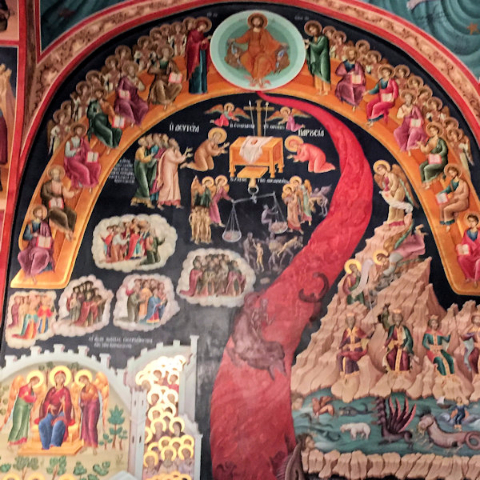 Painted in 1998 for the narthex of the Church, the holy painting of the Second Coming vividly depicts the end of the present world, the Second Coming of Christ, the resurrection of the dead, and the last judgement, in the same way as described by Jesus Himself during His teachings. The painting, inspired by prophetic references to the end of the world in the Old Testament, underscores the prophecy with an undulating flame rising from the mouth of a dragon. 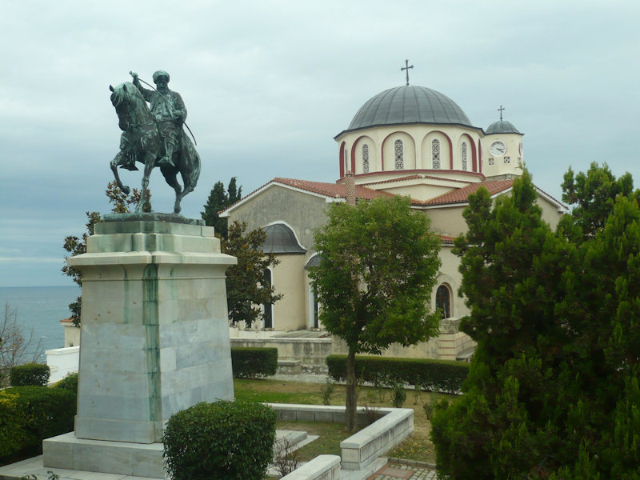 Driving close to three hours northeast from Meteora, we reached Thessaloniki for an overnight stopover before heading north to Thrace. 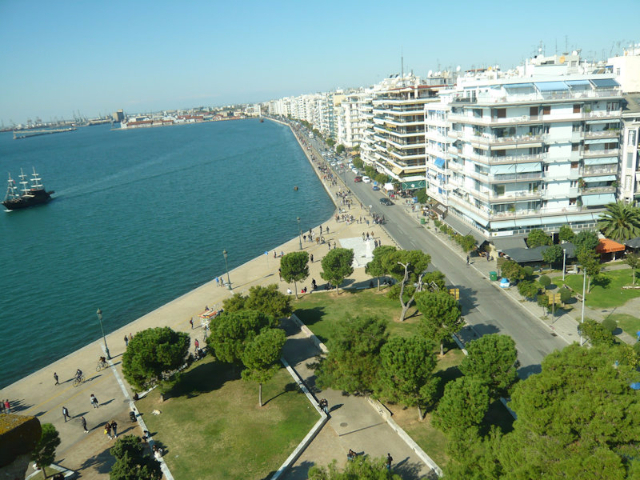 Thessaloniki was donned in Greek flags in preparation for the national public holiday the following day, called Ohi Day (ohi meaning “no”), which is an annual commemoration on October 28 of the Hellenic counterattack against invading Italian forces in 1940. On this day war heroes are honored; ships in the harbor are open for public visits. 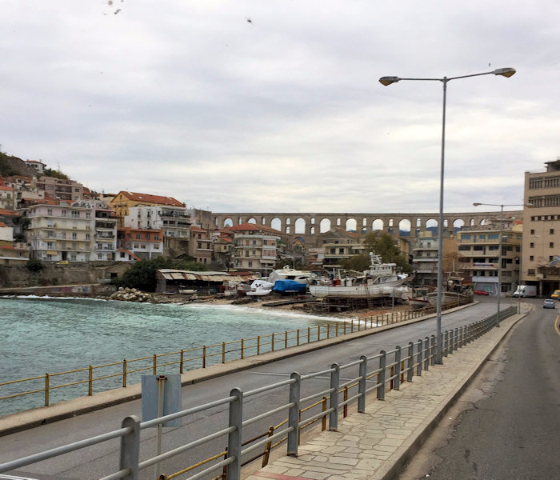 In the morning, as streets grew populated because of the holiday, we headed north to Kavala on the Aegean Sea. 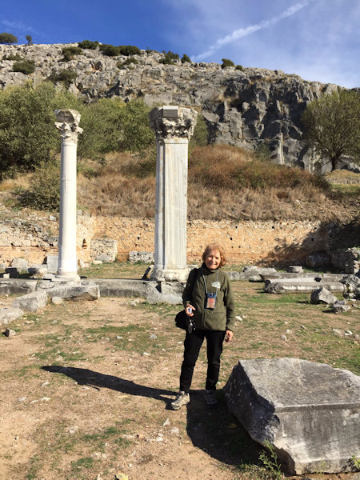 Passing scenic lakes, farm lands, and mountains, we first stopped at the archeological ruins of Philippi, a World Heritage site. 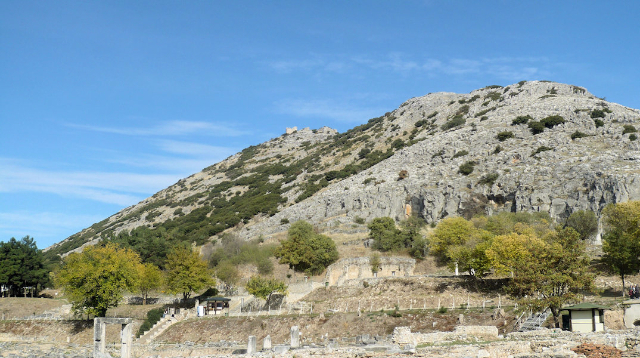 Founded by the Thasians in 360 BC, the colony of Krinides was renamed by Philip II in 356 BC when he conquered it to take control of the gold mines in neighboring mountains. 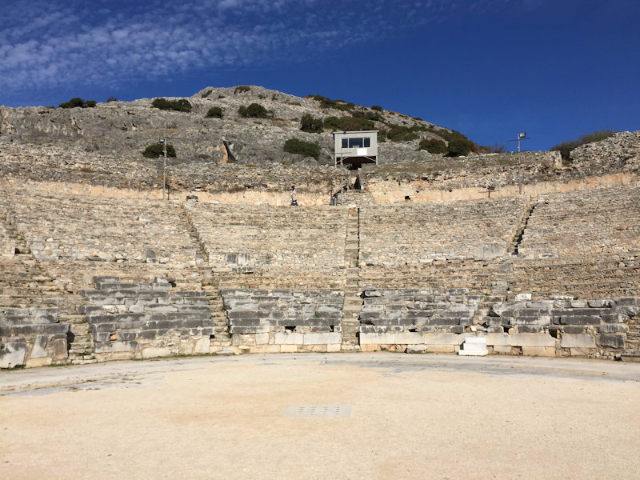 In 49-50 AD, during the Roman era, the city was visited by Apostle Paul, who gave his first known sermon on European soil here, lending the site biblical importance. 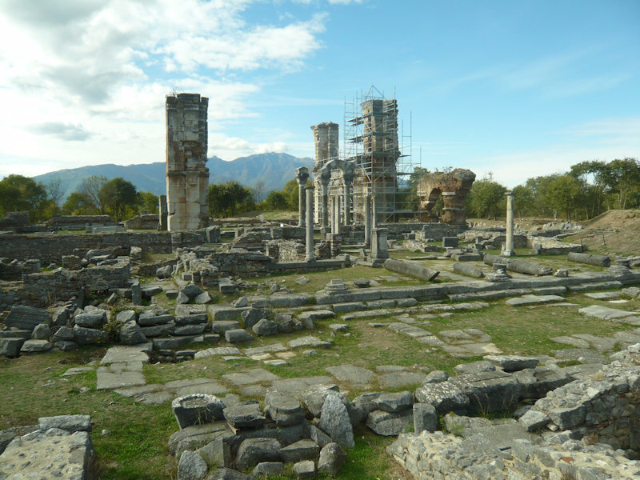 Philippi, which became prosperous in the 5th and 6th centuries, was abandoned in the 14th century after the Ottoman conquest. The ancient city, which is still being excavated and restored, occupies a large site. 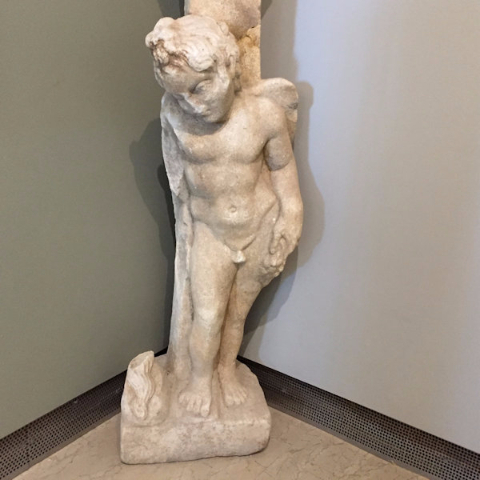 It includes an Acropolis at the summit of a fortified hill, a theatre, three basilicas, a Forum, a monumental octagonal church dedicated to St. Paul, a market, residential zones with mosaic floors, and underground tombs. 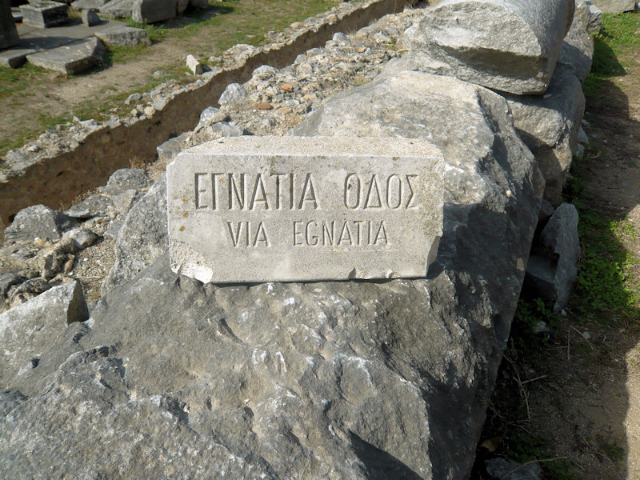 Part of the Via Egnatia, the main east-west street traversing the city center during Roman times, has also been uncovered. 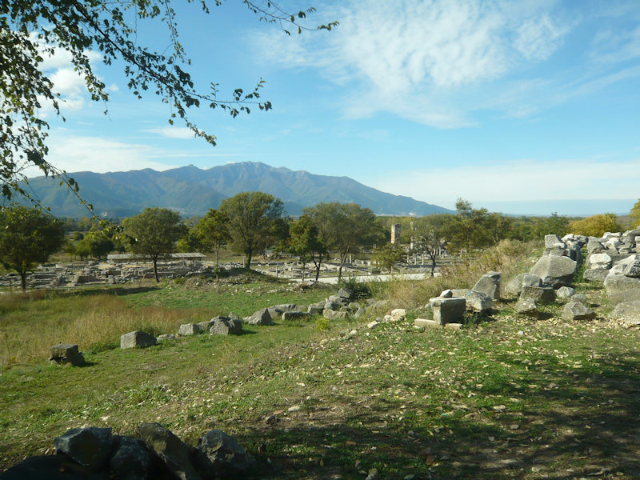 Finds from the long years of excavations are exhibited in the Archeological Museum of Philippi on the outskirts of the site. 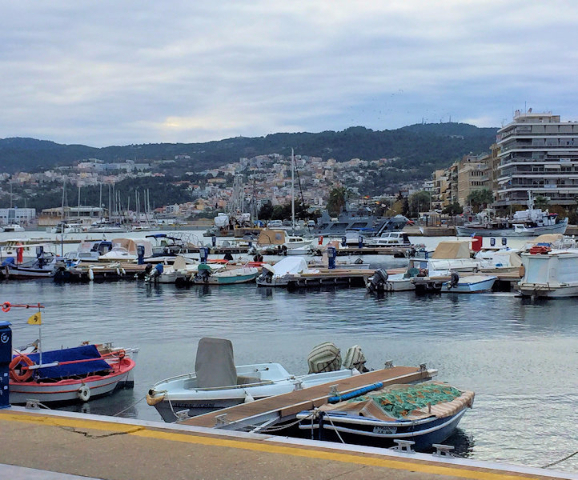 Kavala is the second largest city in northern Greece and its largest commercial port. Formerly a settlement called Neapolis, after its submission to Philip II it became the port of his newly founded colony of Philippi. Following St. Paul’s first arrival at the port, the city became a place of pilgrimage and the name was changed to Christoupolis, which later became a powerful Byzantine stronghold. 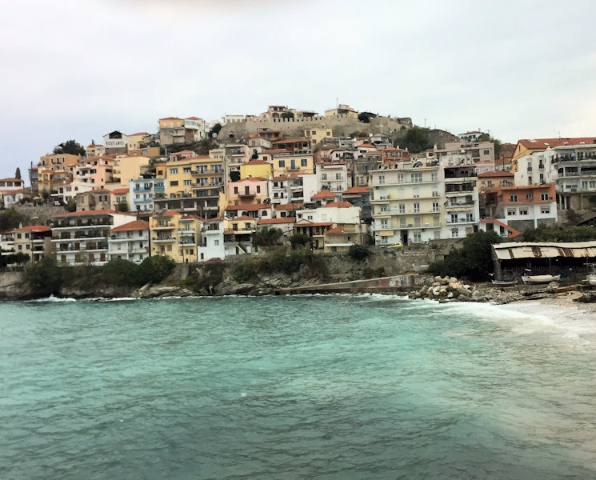 The city was renamed Kavala at the end of the 15th century and developed on a grand scale during the time of Suleiman the Magnificent (1520-1536), taking on an Ottoman flavor. Our city excursion started by the city walls in the old town with a visit to the house of Mohamed Ali, a native of Kavala, who was granted the governorship of Egypt in 1805 upon the departure of the French. He became a major figure in the Eastern Mediterranean by improving the living standards of the people and strengthening the international position of Egypt. 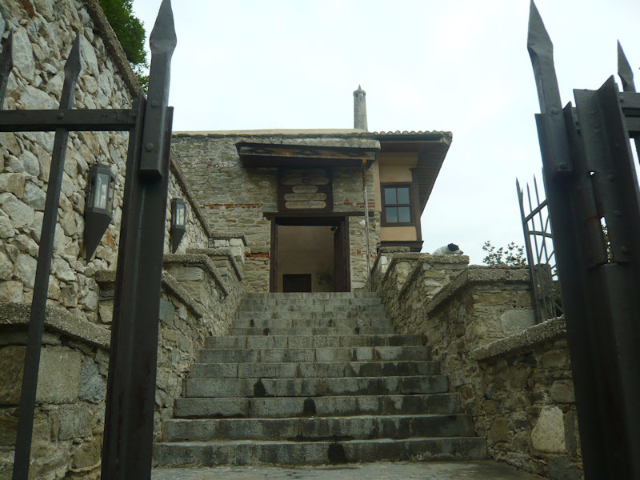 His house in Kavala, a splendid example of 18th-century Ottoman architecture in Greece, is now a museum. The two-story house displays the characteristics of a wealthy residence, with a fireplace in each room, separate quarters for men and women on the first floor, and service areas on the ground level. A few objects such as carpets, furniture, and pottery displayed in each room help visualize a bygone era. 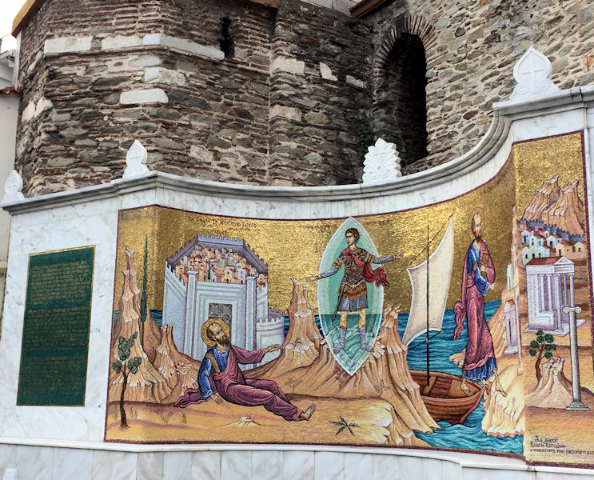 Other points of interest in Kavala are the marina; the harbor; the Church of St. Nicholas, featuring a shimmering mural dedicated to St. Paul in front; the nearby statue of Mohamed Ali on his horse gifted by Egypt; and the aqueduct built during the time of Suleiman the Magnificent. Our day ended with local specialties of mezes, grilled fish, wine, and kourabiedes – sugar-coated almond cookies. 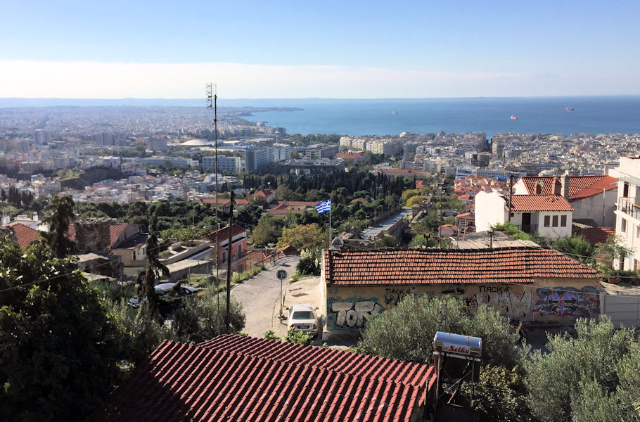 On our final day in Greece we returned to Thessaloniki, about 100 miles west of Kavala. 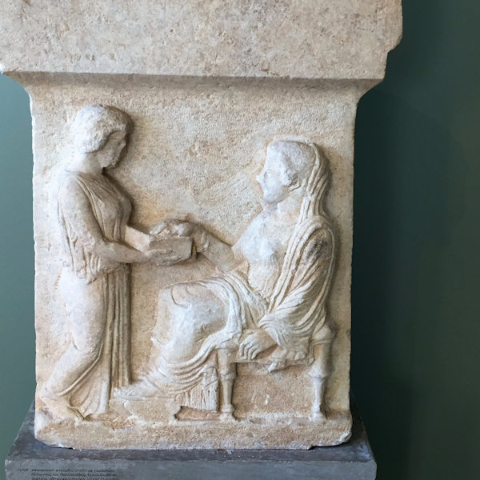 On the way we stopped in Amphipolis, a city founded in 437 BC as an Athenian colony. It was a flourishing commercial center of the Macedonian kingdom, and in the Roman period served as a way-station on the Via Egnatia. 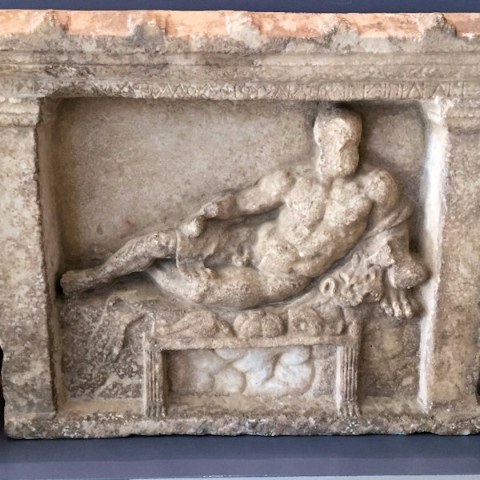 The city’s symbolic monument is the Lion of Amphipolis, a 4th-century-BC tomb sculpture, which has been discovered in pieces buried in mud in the nearby Strymon River and restored to its present form. 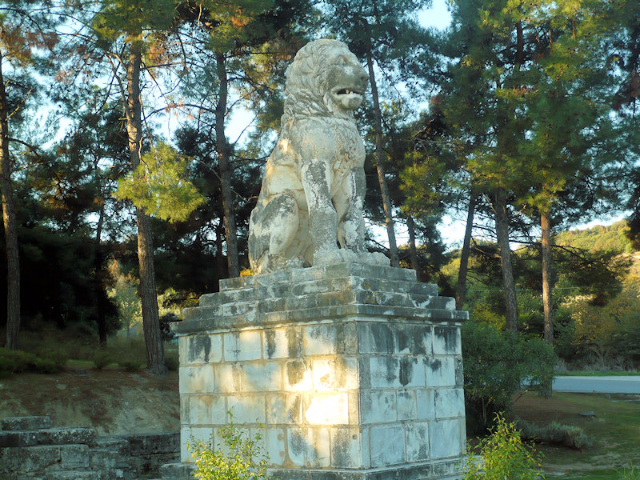 The four-meter-tall marble lion sits on a pedestal of equal height on the west bank of the river, where it was found. 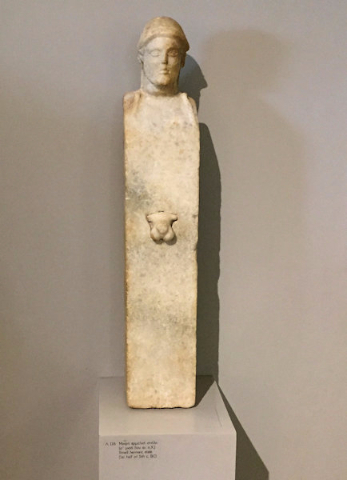 Another place of note is the Archeological Museum of Amphipolis, which presents the long history of the city and its surroundings from the Neolithic to the Byzantine period. 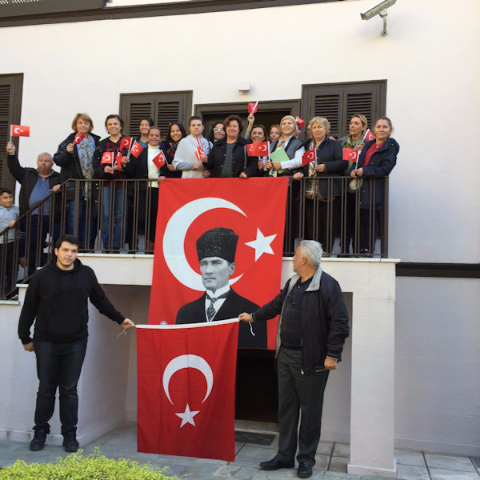 Upon our return to Thessaloniki on October 29, which coincided with Turkish Republic Day, we continued with a tour of places we yet had to see, including the House of Ataturk, where the founder of modern Turkey, Mustafa Kemal Ataturk, was born. 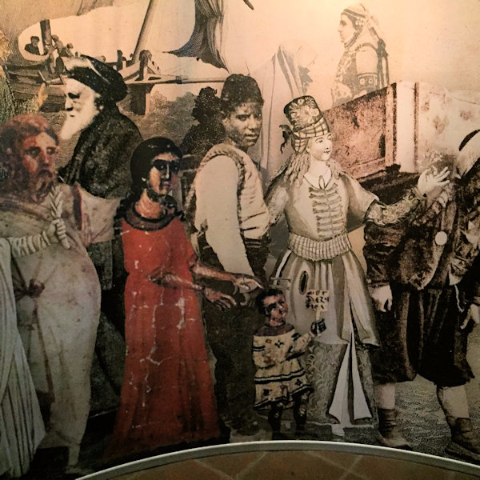 Because of the holiday there were many Turks, who had journeyed from Istanbul to visit his birth place, which is now a house museum and part of the Turkish Consulate complex. 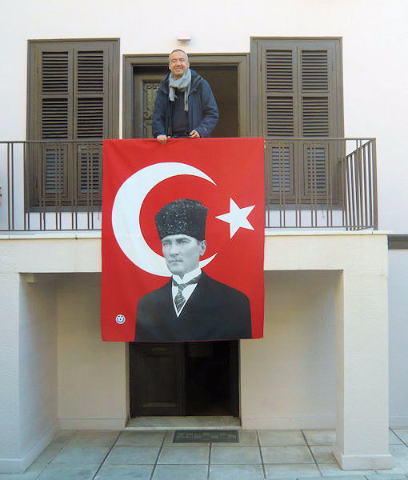 Complete with all period furnishings, the museum provides historic information about Ataturk and his life, especially while he was in Thessaloniki. 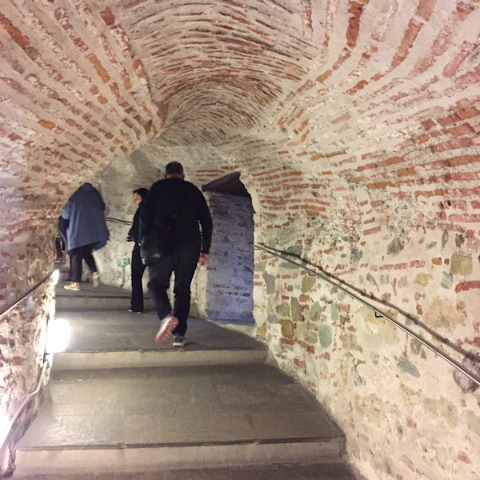 Although we had seen the illuminated view of the White Tower before, a daytime visit allowed us to go inside the circular tower and climb up the six flights of connecting stairs to the terrace for a panoramic view of the city. 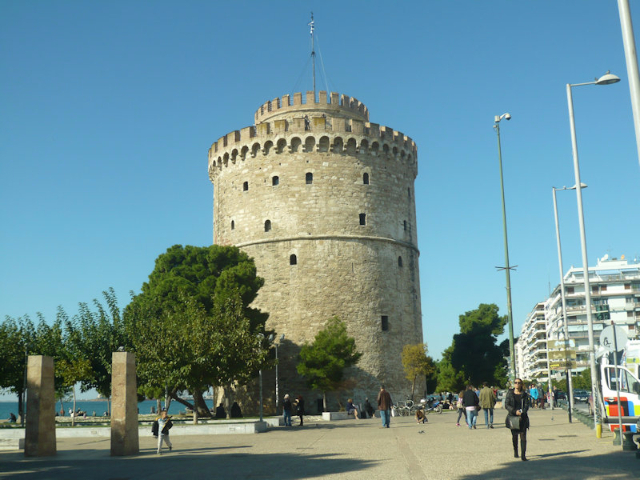 Built on the waterfront as fortification during the time of Suleiman the Magnificent, the tower is now home to the Byzantine Museum of Thessaloniki, featuring exhibits of sculpture, pottery, fragments of mosaic floors, orthodox icons, and the like. Our late-night flight back to Istanbul allowed us some free time on our own. 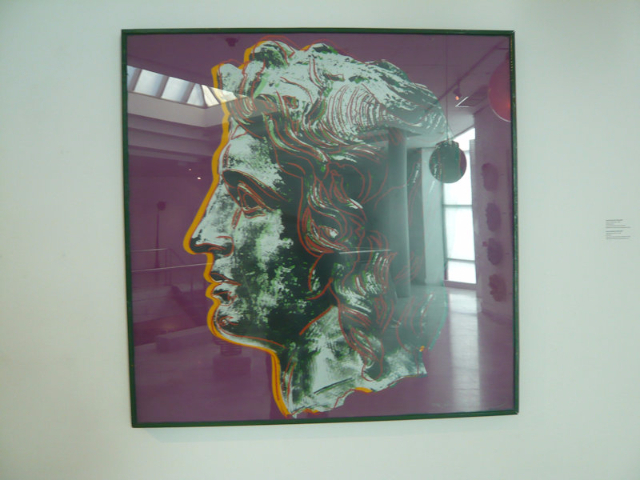 A few of us went to the Macedonian Museum of Contemporary Art, which I would include among the highlights in Thessaloniki. 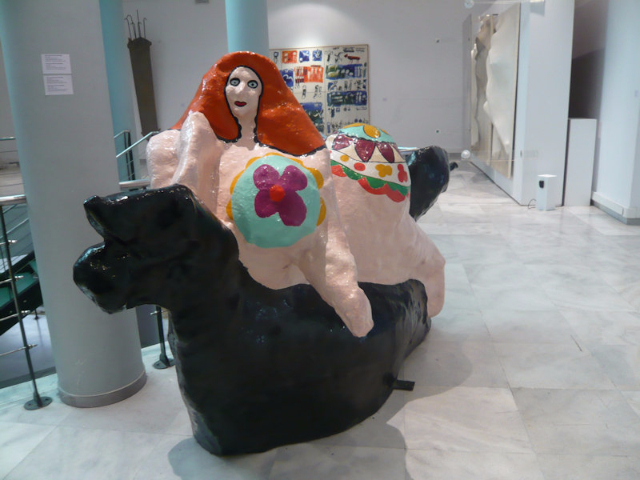 The museum’s permanent collection includes works by prominent Greek and international artists, such as Niki de Saint Phalle, Oppenheim, Takis, Tinguely, and Warhol. A special exhibition curated by Yoko Ono, titled Imagine Peace, had numerous indoor and outdoor installations that invited reflection, including several by Yoko Ono herself. 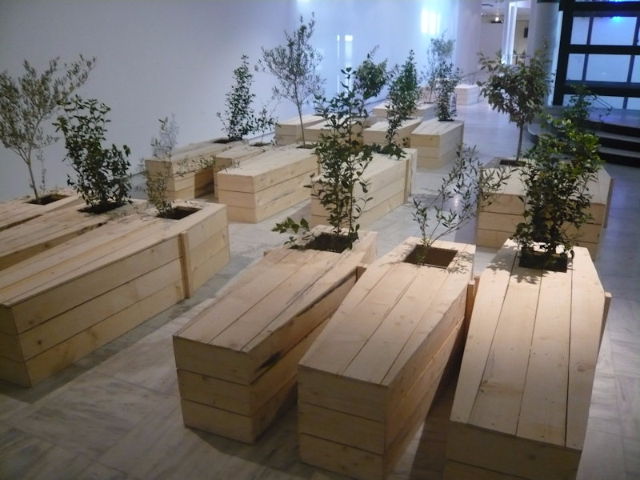 One such installation was her roomful of custom-built coffins of various dimensions, each giving life to a citrus tree, which grew through the opening where one usually sees the face of the dead. 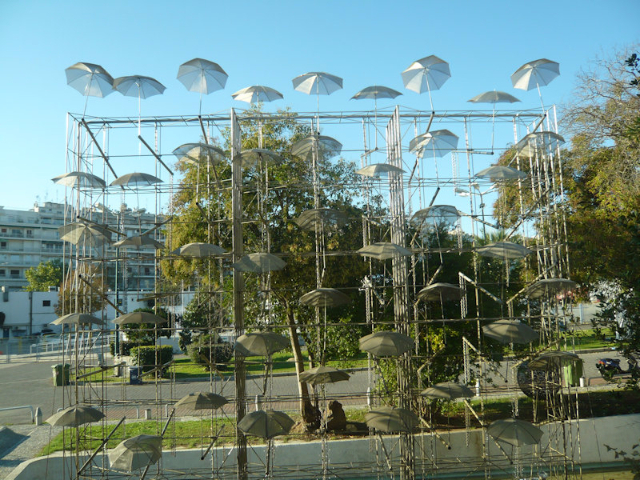 An outdoor sculpture by Greek artist Zongolopoulos, consisting of several dozen umbrellas opening up at different levels of a tall tubular metal scaffolding in the museum’s front yard, delighted passers-by with its mass effect. Reflecting on the variety and intensity of this one-week cultural expedition during the flight back to Istanbul, I said I wished the trip had been longer, only to be reminded by my traveling companions that most had to be at work the following week. I was glad to have had the opportunity to join them.